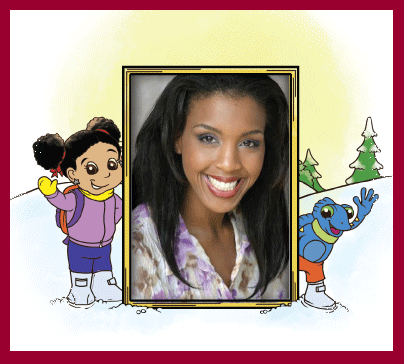 Cree can hardly wait to fall asleep because she knows her dreams bring exciting adventures. Cree quickly finds out that her toy chameleon, Scooter, is very special as he comes alive in her dream . 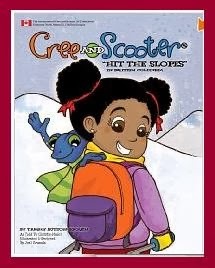 With Scooter's help, Cree's dreams become exciting adventures that take her around the world to lands of different people and their customs. You can learn too! Join Cree and Scooter on their trip to British Columbia, Canada. Cree and Scooter Hit the Slopes in British Columbia is the first book in The Adventures of Cree and Scooter, a series. It is geared toward children aged 4 to 8, and it exposes young readers to various cultures in an age appropriate manner. This unique series is fun and interactive, while promoting children's educational development. This book connects young readers with the two main characters, Cree and Scooter, as they navigate their way through many countries across the globe. Going back and forth between the spheres of reality and fantasy, the books in this series come alive when Cree dreams in her bed at night. In her dreams, Cree and Scooter embark upon many exciting adventures. 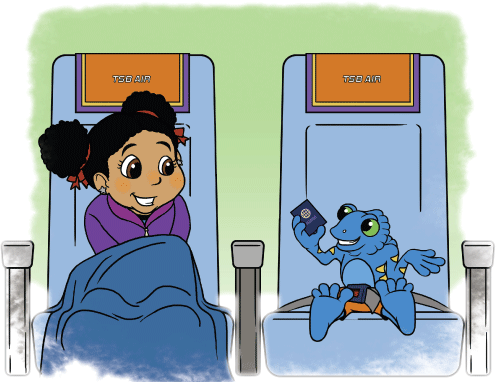 The subsequent books in this series follow Cree and Scooter as they travel to different countries to experience the richness and uniqueness of many cultures of the world. In Cree and Scooter’s outrageous adventures this book showcases some ‘travel mishaps’ and humor into the storyline to engage readers. Cree and Scooter differs from traditional children’s books, as it infuses active academic learning in a fun and engaging manner. Each book in the Cree and Scooter series includes opportunities for readers to learn world geography, history, key words from different languages, and many different cultural customs. Cree & Scooter is a fun and exciting book for young children. My girls are 5 and 9 and both of them loved reading along as Cree & Scooter travel all over the world learning about different countries and cultures! As my children now have friends in other states as well as in Japan, they have begun asking more and more questions about how people all over the world live. I love how my children can have fun learning along with Cree & Scooter as they visit new countries and make new friends. And this first book teaches them some wonderful and exciting cultural similarities and differences so close to home - in Canada! Reading is very important to my family. Each of my children have their own library of books and with new technology like Kindles, iPads, iPhones and such - it is so easy to read on the go now - with ebooks! Cree & Scooter make a great on-the-go read for young children - so make sure to add it to your ereading device! And don't forget - ebooks make SUPER gifts! Such a cute beginning book for this up and coming children's series! WNBA (Women’s National Basketball Association) veteran and two-time All Star, Tammy Sutton-Brown was born in Ontario, Canada. Being a professional basketball player has opened Tammy’s world to experience a host of different countries and cultures. Disclosure: I received free the item(s) mentioned in this post in exchange for my honest review. Regardless ~ All my reviews are my honest and personal opinion. I am disclosing this in accordance with the Federal Trade Commission’s 16 CFR, Part 255: “Guides Concerning the Use of Endorsements and Testimonials in Advertising.”. What a cute book to read! I like that it helps young children learn at their age different cultures! I would love to get this book for my nephew! It is always good to read! you can get it via Amazon as ebook or hardcover - softcover has not yet come out but it is a great book for kids and would make a fun Christmas or Birthday gift too! Thanks for stopping by! Comments are always welcome! The content on this blog is the personal property of Mom Loves 2 Read © Copyright – All rights reserved. You may be eligible to purchase or publish English or translated versions of this content on personal blogs provided you acknowledge Mom Loves 2 Read as the original source and gain permissions from Mom Loves 2 Read prior to publishing.